As a stay-at-home mom, having a routine is key. We all know what happens when the day doesn’t start off right. Not. Pretty. 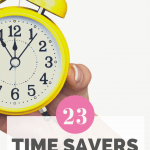 Try these 23 time savers for stay-at-home moms. You’ll feel more willing to play that game of Zingo with the kiddos…and less likely to hide from them in the closet. Bonus: I’ve also included a short time management quiz to give you a gentle nudge in the right direction. Before bed, check your calendar, prioritize tasks, and create a game plan for the next day. You’ll wake up more refreshed and ready to conquer the morning. After dinner each night, make a habit of cleaning and organizing your main areas (kitchen, living room, etc.). Less clutter = less stress in the morning. This little cordless number is a personal favorite I’ve featured in my Instagram stories. Keep breakfast simple with overnight oats, cold cereal, quick biscuits or bagels. Many recipes on my Pinterest breakfast board can magically “cook” overnight. I’m a big fan of freezing muffins for later, too. Assuming you won’t attract any night prowlers, try loading up your vehicle with any bags, backpacks, or other gear the night before. Give the kids more responsibility for small tasks. Delegate chores like setting the table, feeding pets or filling water bottles so you can save time while teaching responsibility. Buy a chore chart to get started. Decide which jobs each person will do, like making coffee, cooking meals, packing backpacks, transporting kids, etc. Don’t just hope that it happens. Plan that it happens! 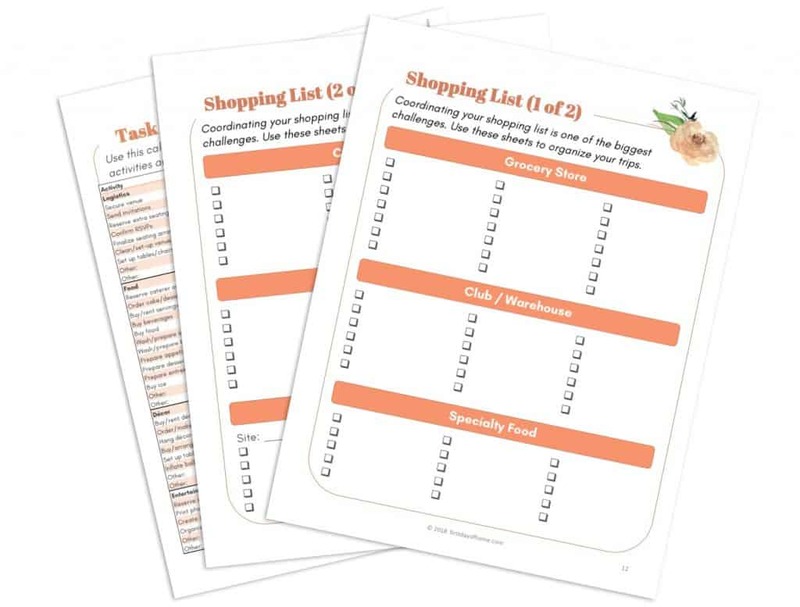 Regardless of who does the grocery shopping, having a “form” to fill out will prevent missed items. It also reminds those who consume the last drop/crumb to write it on the list. See my party planning printables post for examples of how to create a template. If you find yourself constantly shuttling kids back and forth, look into ride-sharing opportunities with friends. Everyone can save a little time with some cooperation! The free app GoKid carpool can help you get started. 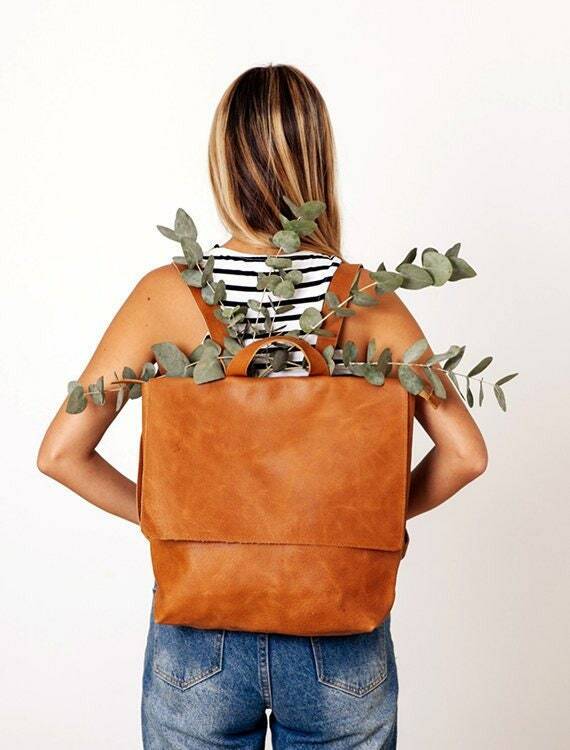 Need to get a head start on errands? Try using delivery or curbside services for tasks like dry cleaning, ironing, and grocery shopping. If it’s too expensive, are there areas in your life where you could save money to splurge here? Many major appliances now offer a “delay start” feature. Examples include pre-heating the oven, washing a load of laundry or scheduling the coffee maker to brew (my personal favorite). Just make sure you can do this safely if younger children are around. If you love coffee as much as I do, invest in this cup warmer! Keeping it in your bathroom while getting ready saves valuable reheating time. If you find yourself struggling with a wake up routine for the kids, buy them their own alarm clock. This model comes with options to change colors when it’s time for kids to rise and shine. 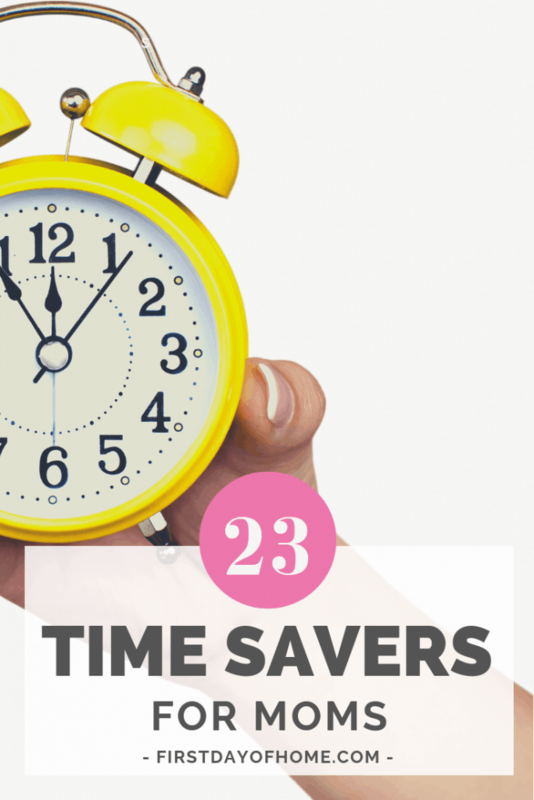 Don’t just use timers for yourself…use timers for the kids as well! There’s some magic to Alexa beeping versus Mommy calling time. A 10-minute warning helps everyone stay on track. If you’re like me, every marketer out there has your e-mail address. Use RetailMeNot.com to find the sales instead, and “Kon Mari” that inbox by unsubscribing to needless e-mails. Create a shared e-mail account with your partner so you both receive important bills, school communications and other family-related correspondence. Then, you can both tackle the to-do list. Catch my drift? If you find yourself always typing the same phrases, e-mails, websites, etc. into your phone, it’s time for keyboard shortcuts! Turn “ly” into “I Love You!” in a fraction of a second. Yes, I’m a bit nerdy, but I believe there’s nothing better than getting my national news, local news, traffic and weather all in a streaming broadcast while I’m getting ready. It’s all about multi-tasking. Listening to your favorite books on Audible can change your time management game. Many of us spend countless hours on Facebook, Instagram and other social media platforms. Try “batching” your screen time each morning/afternoon to increase your ability to focus. Some activities need to take place as they happen. However, you can save time by batching repetitive tasks together. Examples: lunch prep, cleaning bathrooms, folding laundry, ironing. This is easier said than done if you have an affection for fabrics like linen. I’m just sayin’ that wool, cotton-polyester blends and synthetic fabrics mean less ironing. Fine. You can’t resist a good wrinkly fabric. If you use this handy spray after washing, you’ll minimize the ironing needed later. Download the First Day of Home Time Management for Moms Quiz, and create your plan today! I hope you’ll find opportunities to save time so you can spend it with those you love. As always, I appreciate you pinning this article or sharing it with friends! We always had a the shopping list on the fridge so everyone could add to it, It worked reasonably well, especially when people missed out on their favourite things because they’d not added them to the list, once that happened a few times they soon got the hang of it! When the kids were older we moved to a shopping app that we share which works pretty well too – ideal for a houseful of adults/young adults. Don’t you love it? Yes, our list has been modified over time, but I like the old-fashioned paper copy when I’m doing the shopping. I hope to post our grocery shopping process soon. We’ve used it for 9 years now! 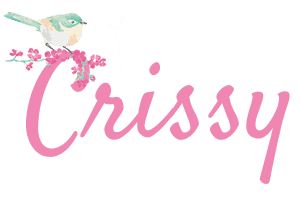 Hello Crissy. Time management is really important for everyone. I am really helpful to get your idea and I am going to apply for me. Thank you for sharing. Hi Sarah. Thanks for stopping by. I do hope you’ll be able to use some of these suggestions to make more time for yourself! This is a GREAT list, Crissy! Pinning to my Organize It board! Thank you, my dear! I appreciate you pinning it and sharing the tips! Crissy, these are great time saving tips for just about anyone and a few extras I haven’t thought of. Thank you! Thank you, Michelle! I’m thrilled to hear that I might have given you a few ideas. I hope they give you back some time! These are great tips even for Moms like me who work part time out side the home. Love that little alarm clock, and I definitely need to spend sometime unsubscribing my email. Love all your great ideas. I love the idea of the coffee warmer. Thanks so much! Thanks, Susan! I hope you’ll enjoy using some of these tips to save yourself some time!